Award-winning visitor attraction The Canterbury Tales will be promoting itself to more than 1,300 group travel organisers, tour operators and buyers when it exhibits at one of the biggest group travel shows in Europe later this month. The Canterbury Tales will be joined by over 300 exhibitors at Excursions, which takes place at London’s Alexandra Palace on 23 January. The Canterbury Tales has welcomed more than two million visitors since it opened in St Margaret’s Street and will be promoting a range of special deals and initiatives to group travel buyers from across the UK and Europe. The Canterbury Tales brings to life five of Chaucer’s best-loved stories with tales of love, romance and trickery, vividly recreated with all the fun of his original tales. Its stunningly accurate reconstruction of 14th century England, set inside the former St Margaret’s Church, gives visitors the opportunity to step back in time and experience the sights, smells and sounds of medieval times. 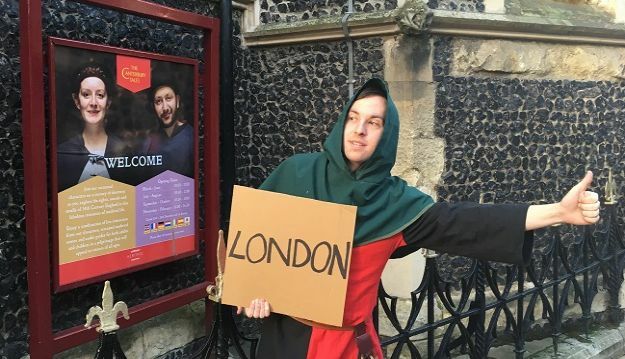 Join Chaucer’s band of pilgrims as they embark on a journey from The Tabard Inn to Canterbury Cathedral. The Canterbury Tales is a Continuum Heritage Attraction. Continuum Attractions offers a host of cultural visitor attraction experiences across the UK, from York’s Chocolate Story to Edinburgh’s underground history told under the Royal Mile.